Editor’s Note: This post was written by Dr. Chris Elcock, an adjunct professor at the Université Jean Moulin Lyon 3 in Lyon, France, whom you might remember from his article on the early years of cannabis activism published last month. Today he discusses the use of LSD in New York City in the 1960s and its effect on the city’s culture. Enjoy! Eight years ago I developed a keen interest in the social history of psychedelic drug use and ended up starting a PhD thesis on the history of LSD use in New York City. I based my project on the premises that New York had been somewhat ignored in the scholarship and in the popular mind. When you think of LSD, you think of the West Coast in the 1960s and its colorful Haight-Ashbury scene. San Francisco certainly had a long tradition of tolerance toward Bohemians and eccentrics and it seemed quite natural that such a psychedelic scene should have blossomed there. But what about the Big Apple? As one the most influential metropolises in the entire world, surely the use of mind-altering drugs would have led to the development of a very complex scene indeed. The psychedelic drug experience often led to vivid visions, feelings of distortion of time and space, and deep introspection. Users then typically reported new insights into their lives and the world they lived in. 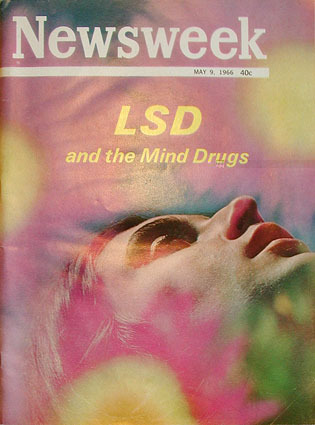 In a post-war context of suspicion of abnormality embodied by Cold War politics, rampant consumerism, and what many saw as an authoritarian form of conformity, some LSD users concluded that there was something terribly wrong with the American Dream and reasoned that they needed to “drop out” of society to create a better world. This was not very different from the San Francisco scene, but NYC did have some vocal and charismatic figures to help refine these sensibilities. A psychedelic movement began in the early 1960s when Harvard professor Timothy Leary and Beat poet Allen Ginsberg decided to start a peace and love movement that involved giving psilocybin (the main psychoactive ingredient in mushrooms) and LSD to influential people. Though Leary was based in Concord, Massachusetts, he spent a lot of time in the New York with these new and mysterious compounds. But rather than target high school and college students, whose consumption was much more visible in the second part of the 1960s, the pair gave those drugs to prominent New Yorkers: theater producer Van Wolfe, heirs to the Mellon family Peggy and Billy Hitchcock, and jazz musicians Charles Mingus, Allen Eager, and Maynard Ferguson, to name but a few. A visible psychedelic counterculture soon developed locally and sought to carve out spaces to exist and attract like-minded individuals. That was not the whole story, however, and it would be wrong to reduce LSD to an agent of change for revolutionaries. In a context of widespread pharmaceutical consumption, LSD was just another substance in the chemical age – until authorities targeted it in the latter part of the 1960s. A wide pool of New Yorkers tried it regardless of race, class, gender, occupation, and sexual orientation: bankers, lawyers, doctors, teachers, estate agents, clergymen, prostitutes, postal clerks, and stock-brokers partook. In some cases the motivations behind the desire to experiment were surprising. For instance, a woman went into labor under the influence of LSD, with the approval of her doctor, in order to intensify the birth-giving experience. And many business people indulged in the highly potent psychedelic DMT because a trip lasted only between thirty minutes and an hour and could thus fit into a tight corporate schedule. As an international hub for the arts, New York also saw the development of ground-breaking psychedelic art. The seminal painter Isaac Abrams allegedly began his career as a result of LSD use and he later perfected it by studying with visionary painter Ernst Fuchs in Vienna. 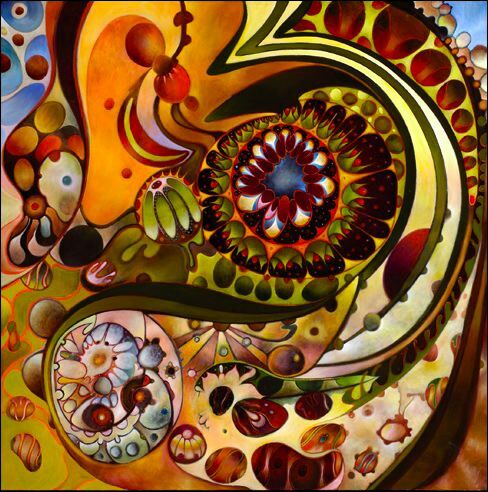 He developed a vibrant, swirling, and kinetic kind of art reminiscent of the psychedelic visions. Poet Gerd Stern, who initiated Allen Ginsberg to cannabis and co-founded USCO (the Company of Us), was another important figure. USCO was an artist collective that pioneered a new kind multimedia art that summoned most of the senses in an attempt to recreated the ego-shattering psychedelic experience without the use of drugs. But as a major centre for business and advertising, New York City was not going to let these artists stay confined to the art world for long. Multimedia light-shows were soon incorporated into discothèques, when hard-nosed entrepreneurs realized that they could attract youthful and hip patrons by offering disorienting experiences in their clubs. Peter Max, whose work is still remembered in the Beatles’ Yellow Submarine, also coined the concept of “Transit Art” that he produced on behalf of the Metro Transit Advertising that owned an advertising franchise on about 20,000 vehicles and which was looking for new ways to attract customers. His art was an offshoot of psychedelic posters that had gained legitimacy as an art form in the latter part of the Sixties and under psychedelia’s increasingly visible influence. As of 1969, his company had printed 2.5 million posters and his designs had appeared on over 40 products, but also in boutiques and restaurants. New York’s psychedelic moment was rich and complex but it did not end in the 1960s. Artists like Abrams and Alex Grey never stopped creating mind-altering art and, though psychedelics became obscured by addictive drugs like cocaine, heroin, and crack, a more discreet psychedelic subculture continues to experiment with obscure compounds today.